This year Mahindra Navistar has won two Apollo Tyres - CV magazine awards: The coveted 'CV of the Year' & the 'Heavy Truck of the Year'. These honors are a great accomplishment for Team MNAL, which has been working diligently for the past 5 years. It is certainly a moment of pride for the team. 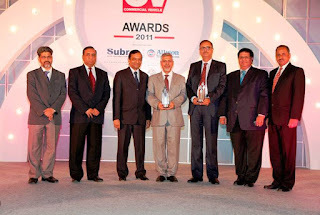 The awards were received by the Mahindra Navistar Team led by Dr. Pawan Goenka and Mr. Nalin Mehta. Such celebrated appreciation of Mahindra Navistar by top awards of the CV industry is an indication that many such accomplishments await Mahindra Navistar in the near future. First telecast on 28th April 2011, Thursday at 1900 hours. Repeat Telecast on 1st May 2011, Sunday at 1200 hours. Do catch the telecast on Zee business at the mentioned time.